RRB NTPC Online Aptitude Test 2017– Railway Psycho Online Test for Practice: RRB has uploaded Sample of Online Computer Based Test (CBT) for 3rd Stage exam 2017. As you know, Railway has changed its exam pattern and introduced Online exam (Psycho/ Aptitude Test) system first time in its recruitment process for Non Technical (Graduate) exam for Assistant Station Master (ASM) posts. We highly recommend applicant to practice RRB Aptitude Online test before psycho exam. 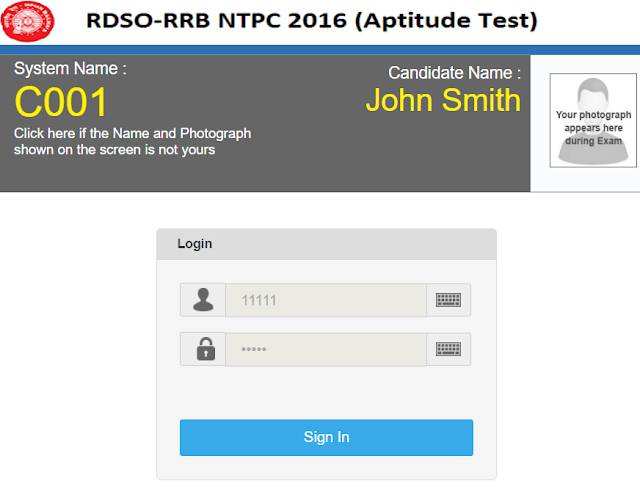 As, RRB NTPC ASM Result to be out this month, here we have brought you RRB Online Aptitude Test for Practice. Using this RRB NTPC ASM Psycho Online test applicants can trained themselves for upcoming Railway Non Technical (CEN 03/2015) 3rd Stage online exams which is Aptitude Test. What is RRB Online Aptitude Test? What is Psycho Online Test? How to solve online test questions? These are the basic questions candidates have in their mind. The main reason to introduce Online Exam system in RRBs examination is to speed up the Recruitment Process as well as to increase transparency in Railway Selection procedure. Railway has recently announced 3rd stage computer based test (CBT) for its ongoing RRB ASM, Goods Guard, CA, TA, Clerk-Typist recruitment 2016-17. All those candidates who will attend RRB online Aptitude/ Psycho Test first time must go through RRB Online Aptitude/ Psycho test for practice. 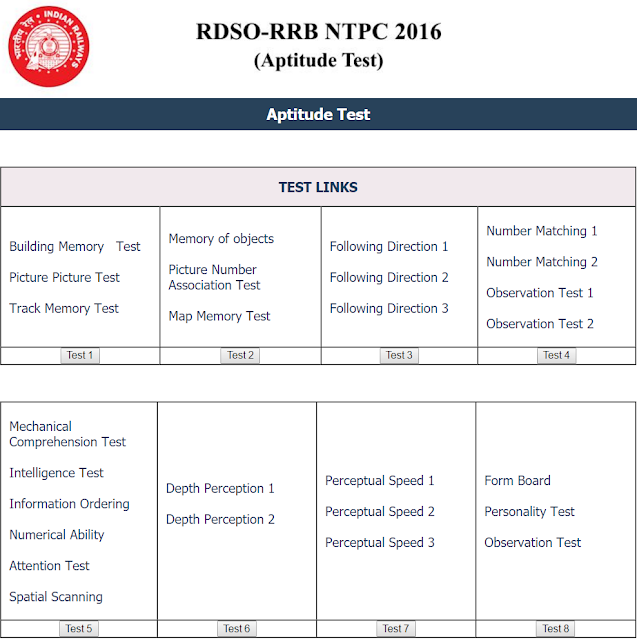 This sample practice test for Railway NTPC Psycho Exam will help candidates who are not familiarize with computer based online aptitude tests. How to deal with RRB Online Aptitude Test? You candidates are not need to worry any more. Here we are providing some basic details about this Railway online psycho/ aptitude test for its Non-technical posts. Here is everything you need to know about RRB Online Aptitude Test structure. Have a look at the step by step guide on how to deal with RRB Online Psycho Test. Visit RRB Online Practice Test page. Select Language i.e. English or Hindi. 1. Total duration of examination is 12 minutes. 3. 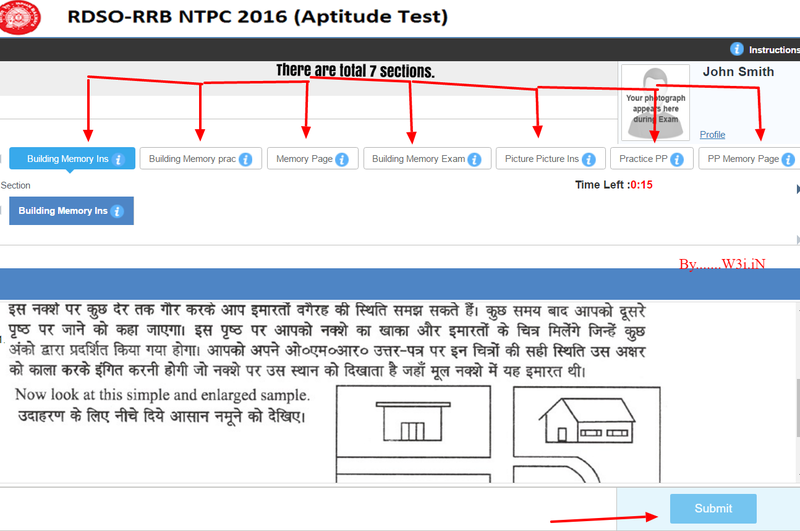 The Question Palette displayed on the right side of screen will be same as RRB NTPC CBT Exam. 4. The Marked for Review status for a question simply indicates that you would like to look at that question again. You can click on the ">" arrow which appears to the left of question palette to collapse the question palette thereby maximizing the question window. To view the question palette again, you can click on "<" which appears on the right side of question window. a. Click on the question number in the Question Palette at the right of your screen to go to that numbered question directly. Note that using this option does NOT save your answer to the current question. b. Click on Save & Next to save your answer for the current question and then go to the next question. c. Click on Mark for Review & Next to save your answer for the current question, mark it for review, and then go to the next question. e. To mark the question for review, click on the Mark for Review & Next button. 7. To change your answer to a question that has already been answered, first select that question for answering and then follow the procedure for answering that type of question. 8. Sections in this question paper are displayed on the top bar of the screen. Questions in a section can be viewed by clicking on the section name. The section you are currently viewing is highlighted. 9. After clicking the Save & Next button on the last question for a section, you will automatically be taken to the first question of the next section. 10 You can shuffle between sections and questions anytime during the examination as per your convenience only during the time stipulated. 11 Candidate can view the corresponding section summary as part of the legend that appears in every section above the question palette. We will soon provide complete Syllabus and Exam Pattern for RRB NTPC Aptitude Test for Assistant Station Master (ASM) post.